Any good cook will tell you that soups are a labour of love. Generally, they take time and a little bit of effort, but like any thing that is worth waiting for, they are absolutely heartwarming. Soups, especially noodle soups, are my go to bowl of comfort. I love the combination of textures (solid and liquid, squishy and firm), the slurping, the messiness, the fun, the satisfaction. But, the thing about good soups is that they can be elusive. Sometimes you don’t even know they exist. 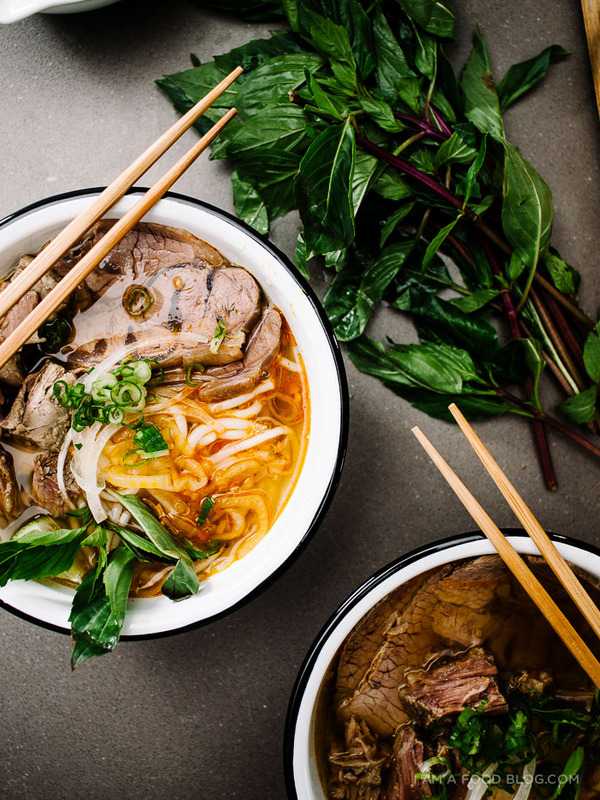 Case in point: bun bo hue, a spicy Vietnamese noodle soup that is absolutely addictive. Before Mike, even after eating countless bowls of Vietnamese noodles, I’d never heard or come across it. 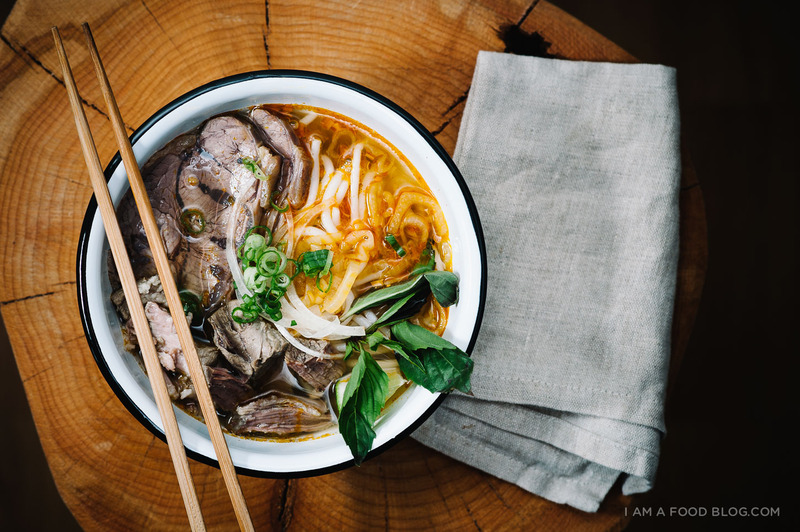 When we started going out, Mike told me that bun bo hue was one of his favorite soups growing up. He took us out for a couple of bowls of BBH (as Mike and I lovingly call it) and I was addicted. I’ve been wanting to make BBH ever since. BBH isn’t quite as popular as pho and I’m not quite sure why. It might be because it’s from Central Vietnam or it might just be because it hasn’t yet made its way into the spotlight. But, if you look for it, you can find BBH specialists. There’s even a place down in San Diego that has a BYOP (bring your own pot) so you can bring home enough BBH for your whole family and then some. BBH is spicy, sour, salty, and sweet all at once. 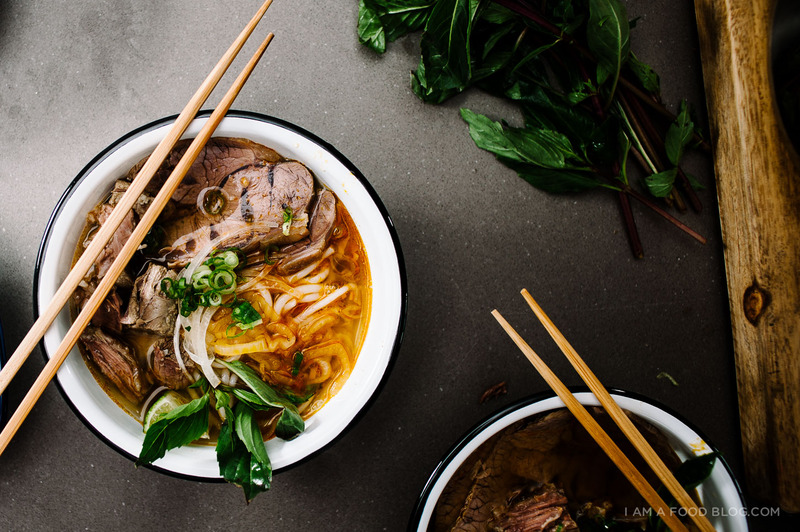 The beef and pork based orangey broth’s main flavour is the delicate herbaceous of lemongrass. The rice noodles, are cylindrical and round, slippery and firm. The brisket is tender and the garnishes add the freshness you expect when eating a bowl of Vietnamese food. I based this recipe off one I found in Charles Phan’s Vietnamese Home Cooking. I left out some bones and garnishes (I didn’t do the traditional cabbage, banana blossoms, perilla, or blood cubes) but it was still an incredibly tasty bowl of noodles. Mike and I slurped it up three days in a row and when we were done, we wanted more. It was Mike’s birthday yesterday and this noodle soup is what I ended up making for his birthday dinner. I think noodle soup is the perfect way to celebrate the person I love most in this world. After all, love is like soup: warm and cozy, nourishing and filling. Love is the crook of your best friend’s arm as you fall asleep at dawn, bursting into laughter together over nothing at all, long lingering walks talking about everything and nothing. Love is the big things, the little things, and everything in between. Happy birthday baby! Cook the noodles according to the package and then divid among deep soup bowls. Top with brisket slices and a bit of oxtail meat. 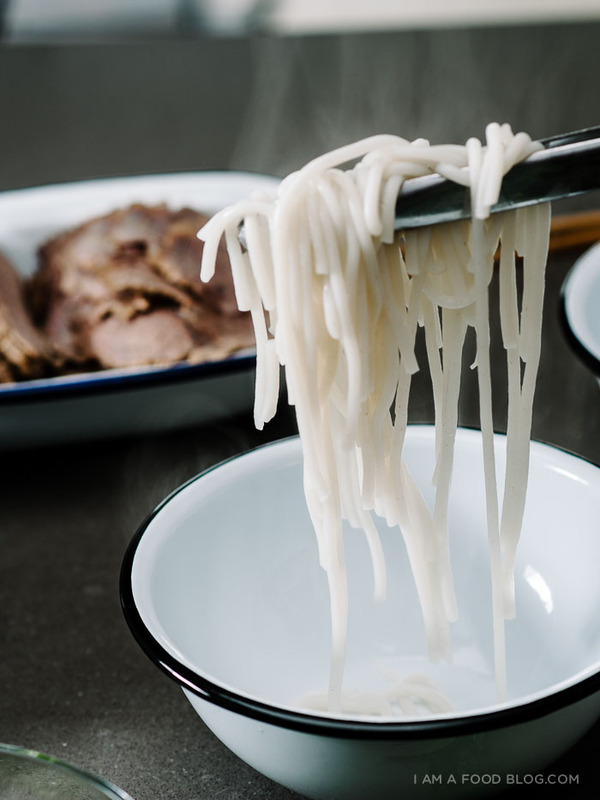 Ladle the hot stock over the noodles and beef and serve immediately, accompanied with the platter of garnishes. Enjoy! You can find annatto seeds and shrimp paste at Asian grocers. I’ve also seen annatto seeds in Mexican food stores. The seeds add the red color as well as a nutty, peppery-sweet flavor to the stock. PS – Mike really is the best husband. The other day, we went on a long rambly Tokyo walk with what I thought was no destination in mind. Eventually we ended up at a giant grocery store. (He totally planned it!) Sounds like a strange destination, but this man really knows what I love – shopping for groceries/looking at food :) Love you boo! I could not possibly love this post more, Steph. 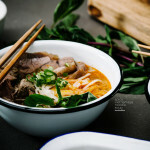 The photos are so vibrant and vivid, your description of bun bo hue is incredible (and made me drool), and your words about Mike just make my heart so full. And that PS!!!! I MELT. You two make me so happy. Thank you so much for making my day brighter :) I need to try BBH sometime soon! This is one of my comfort foods, especially when it’s pouring and I really want to try Hoai Hue in San Diego. Sounds like a fun place! The photos are absolutely amazing! YOUR SOUPS ARE KILLING ME! I want them, I want them all! That glassy rim of orange oil on your soup is so temping. I simply love your photography and I am stunned by how it just better and better with every post.I feel the same way about soups; it is so lovely it has connect you two in such a meaningful way. Thank you sharing such a special moment. Oh man, noodle soup is definitely the way to my heart. This would be my dream birthday dinner! I’ll have to look for this in Calgary – we have tons of Vietnamese places so I’m thinking it must be out there somewhere. Also I’m glad I’m not the only one who loves going to grocery stores and looking at food! omg did you watch Anthony Bourdain’s Part’s Unknown??! Love this noodle! I was wondering what to make for Christmas day, and this might be perfect. So glorious and delicious. Also, I love what you have to say about your husband. When my husband and I were engaged, we had so many married people give us such weird and depressing advice (enjoy it now! once you’re married, the fun part is over), and it really bothered us. Now, having been married for years, I can happily say that getting married to him has made my life a million times better, even during times that life is hard. I think more people need to focus on how great it can really be when you marry your best friend. Oh my godness.. this looks incredible!! Love love noodle soup. This looks so awesome. Thanks for suggesting Hoai Hue in San Diego. I’m only 12 minutes from it, so I will definitely have to try it out to see what it should really taste like before I attempt. I love Asian soups. I haven’t tried this one. But I would love to. We have a new Vietamese little restaurant in our little town too. I am going to see if it’s on there. But it’s nice to have my OWN recipe. So, I’ve never heard of bun bo hue but now I’m obsessed but more importantly, I’m obsessed with you and Mike!! Goodness are you two cute, please wish Mike a Happy Birthday!! BBH is now on my list of things I need to try out soon!! I’m going to try this – sounds delicious! I’m not a fan of cooking for hours but this recipe would be worth it!!! Can’t say enough amazing things about your blog btw. It’s by far my favorite food blog ever. bizarre question, but – what grocery store was it?? my husband and i travelling to tokyo in february and i have literally been researching grocery stores as i fully intend to bring back a haul of food!! We recently got back from Vietnam and loved BBH! I’m so glad I found your recipe, since I was wanting to recreate. 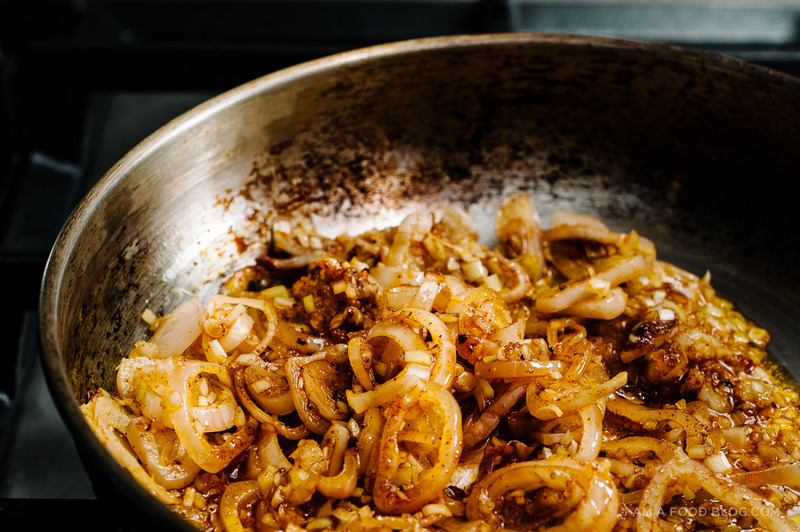 I am also looking for a good basic Vietnamese cookbook, if you had to pick one, what would you suggest? (I have your cookbook and love it!) Thanks! 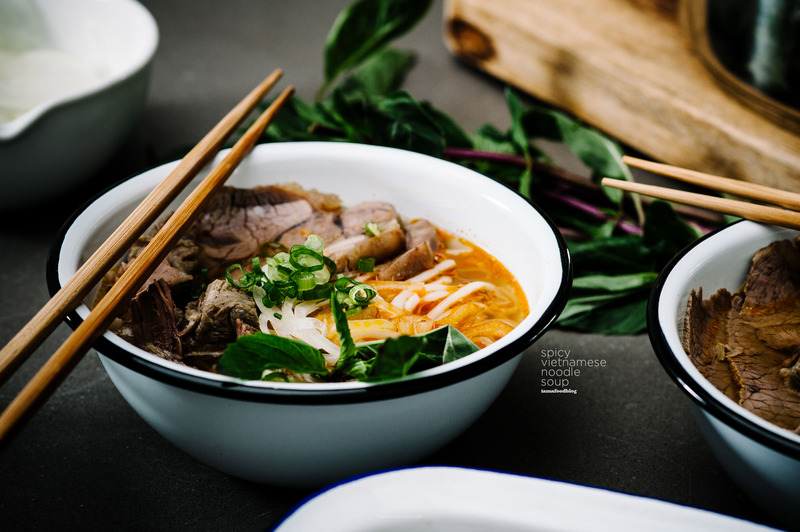 IT SOUNDS GOOD BUT YOU CAN ALSO SIMPLIFIY THE RECIPEE BY BUYING A PACKAGE OF READY MADE BUN BO HUE PICES AT THE ORIENTAL GROCERIES. THS FOR THE RECIPE. Hoai Hue is my spot by the way, I was so excited when I found good BBH in San Diego. Oh and I always get bun bo without the blood cubes (ick). Thanks for the recipe, might have to try this sometime! Looks really taste. I have a pot on the stove as I’m typing this. I posted a link to this on my blog. Spreading the word about great food! Try Mien Trung over by Kearny High School. They use more lemon grass than Hoai Hue. It’s a little hole-in-the-wall place but they too will sell you a pot to go (sans noodles unless you ask). And like you I never heard of BBH until I met my wife, first-generation VN. Add me to the “just LOVE it” cadre. wow, I have to try it out! Thanks!!! Where’s the blood cake? Proper Bun Bo Hue has blood cake. My favorite place in Seattle that served it is closed, I’m so sad. This looks absolutely delicious! Hope to try this soon. Mike sounds amazing btw! I hope one day someone takes me to surprise visits to grocery stores! Wow. Just WOW. I could never attempt to cook that due to all the ingredients and equipment needed but I love BBH for sure. In Grand Rapids MI there is a lovely Vietnamese restaurant on Division St. called Mekong which has a Vietnamese menu and a (Vietnamese-influenced) Chinese menu. Whenever I go there they know what I’m going to order — BBH! Oh wow! This recipe looks so doable! Definitely going to have to try it out. I can’t wait to try this recipe out. Do you have a recipe for bun rieu? oh. i can’t wait! your blog is so addictive. The graphics, images and layout are on point!! !